If you're going to live life to the fullest, do it with passionate pride! Drape yourself in desire with this beautiful blouse by Just Cavalli™! Point collar. 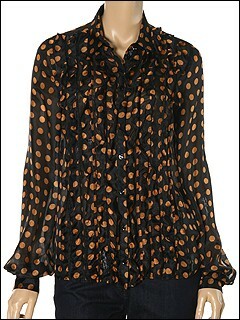 Just Cavalli polka dotted print. ; Button front. Fantastic front features strips of vertical ruffles. Bishop sleeves. Classic cut bottom hem. 100% silk. Dry clean only. Made in Italy. Free shipping in the USA.